NFL's Chiefs Cut Player Seen Attacking Woman — After Video Becomes Public "Earlier this year, we were made aware of an incident involving running back Kareem Hunt. ... The video released today confirms that fact. We are releasing Kareem immediately," the Chiefs said Friday. Kareem Hunt walks off the field before his last game with the Kansas City Chiefs. The Chiefs released him after the release of a video showing Hunt shoving and kicking a woman. 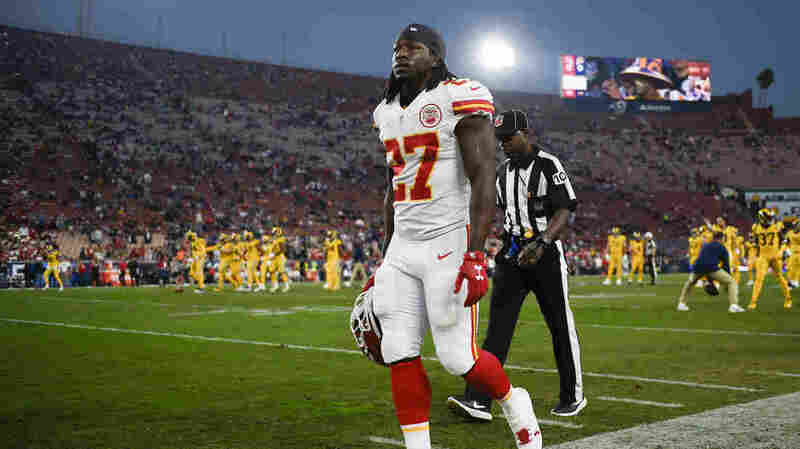 The Kansas City Chiefs cut Kareem Hunt, one of the NFL's top running backs, on Friday, hours after the release of a video showing him attacking a woman. Now, fans are asking a familiar set of questions: What did the NFL know about the domestic violence incident, and did it try to conceal what happened? The security camera video obtained and published by TMZ shows Hunt and a few other people in the hallway of a Cleveland apartment building. Hunt appears to argue with a woman. He shoves her several times — at one point knocking her to the ground and then kicking her — as other people try to break up the fight. The victim told police after the February incident that they should watch the video and that she wanted Hunt arrested, USA Today reported. Police said they did not see the video until it was made public. The NFL investigated but didn't interview Hunt or the victim and also didn't see the video, ESPN said. No charges were filed against Hunt at the time, and the NFL didn't discipline him. Hunt, 23, played in each of Kansas City's first 11 games and entered Sunday's contests with the fifth-most rushing yards in the league. The league and the Chiefs moved quickly after the video surfaced. Almost immediately, TMZ reported, the Chiefs sent Hunt home early from a practice. The NFL placed him on the Reserve/Commissioner Exempt List, which would prevent him from playing. Then, hours after the video came out, the Chiefs announced they were releasing Hunt. The incident drew comparisons to the case of Ray Rice, who in 2014 was initially suspended for two games after he was charged with felony assault. Rice was set to return to the field when TMZ published a previously unseen video of the incident. It showed Rice hitting his then-fiancée who then fell to the ground. In that case, as with Hunt, the NFL said it had asked for the security video but hadn't been given access to it. But according to several reports, the NFL had seen the video but didn't act until it became public — and until it faced intense public blowback over what many fans perceived as a light punishment for Rice. An independent investigation — which was led by Robert Mueller, now the special counsel investigating Russian interference in the 2016 presidential election — determined that there was no evidence the NFL had seen the Ray Rice video but that the league should have investigated more thoroughly. The specter of domestic violence and questions about the league's willingness to address it have lingered since 2014. Other players have been arrested and accused of committing domestic violence. Teams continue to draft players who have a history of domestic violence — sometimes even players who have been seen on camera committing violence similar to Hunt and Rice. In the wake of the Rice video and widespread criticism of the league, the NFL Players Association set up a commission to investigate domestic violence and how the league could address it. But this summer, two of its 11 members resigned. Deborah Epstein, a co-director of the Domestic Violence Clinic at the Georgetown Law Center, wrote in The Washington Post that the commission was "a fig leaf" and that the NFLPA "is no longer interested in even making a public show of concern about violence against women." Days before the video of Kareem Hunt became public, another NFL player lost his job. On Nov. 24, Reuben Foster of the San Francisco 49ers was arrested and charged with first-degree misdemeanor domestic violence — his second arrest this year on domestic violence charges. The 49ers released Foster the next day. But Foster appears to have found a new home: Washington's NFL team claimed him, with one its executives calling the allegations against him "small potatoes."